Fianna Fáil has said a new bill it has published could quickly provide up to 20,000 additional homes. The Vacant Housing Refurbishment Bill eases the planning restrictions around developing homes on the upper floors of older and commercial properties. 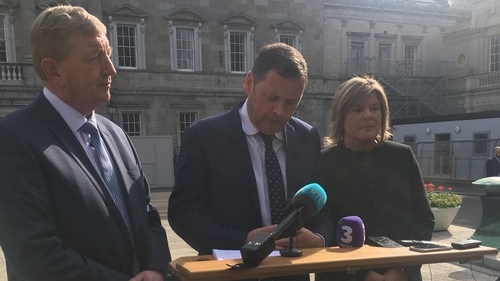 The party's housing spokesperson, Barry Cowen, said the bill removes many of the existing administrative hurdles, but safety standards are unchanged. Dublin City Council recently estimated there are 4,000 vacant spaces above commercial units in the city. The bill is not being opposed by Government and it is likely to be scrutinised by an Oireachtas committee after it is debated in the Dáil tomorrow. Meanwhile, Fianna Fáil leader Micheál Martin has ruled out entering power with Sinn Féin, telling RTÉ's Today with Sean O'Rourke: "We're not engaging in going into government with Sinn Féin in any form." Mr Martin also said that his party remains committed to the confidence and supply agreement underpinning the Fine Gael-led Government. With regards to next week's Budget, he said that housing and health are Fianna Fáil's priorities. Mr Martin said that those on low incomes needed to see a modest increase and that the increase should be higher than the Consumer Price Index. He said Fianna Fáil also had "expectations on the USC front" and expected it to be reduced, as agreed with Fine Gael.